Another year, another fun whirlwind for the team at Boris FX. Like Ego in Guardians of the Galaxy, Vol. 2, we saw you — editors, VFX artists, compositors, and motion graphic designers — create epic universes (and we added a few of our own with new versions of Sapphire, Continuum, and the introduction of Mocha VR). 2017 was a year of amazing work in post-production, and we’re psyched that all of the films on this year’s Oscars “Best Visual Effects” shortlist use our products including Guardians, Star Wars: The Last Jedi, Blade Runner 2049, and The Shape of Water. We can’t wait to see what you’ll do in 2018! If your resolution includes focusing on your well-being (and whose doesn’t?!) in addition to keeping your creative energy flowing, make sure to check out Top Tips to Avoid Post-Production Burnout. You asked, we delivered. In October 2017, we released the latest version of Sapphire (v11), which now includes one of your most requested features: integrated Mocha. The addition of Mocha’s Academy Award-winning planar tracking and masking tools lets you easily create and isolate advanced VFX right inside your timeline. Hip hip hooray! Plus, we’ve added 50 new effects and transition presets designed by top editors and artists. Sapphire is available for Adobe, Avid, Autodesk, and OFX hosts. Individual Sapphire Units are a low cost option to purchase your fave filters by group. Tackle green screen footage fast. The October 2017 release of Continuum (v11) added powerful new tools for keying and compositing. Primatte Studio uses the same Academy Award-nominated tech (Phototron’s Primatte) that major blockbusters rely on to deliver clean keys as easy as 1-2-3. Plus, if you’re getting requests to edit 360° video, Continuum now includes the VR unit dedicated specifically to 360/VR post tasks. Continuum is available for Adobe, Avid, and OFX hosts (with Apple support coming soon). Individual Continuum Units also include improvements and new features. Mocha Pro continues to be the go-to tracking and roto tool for today’s biggest blockbusters, including Thor: Ragnarok, Star Wars, and Wonder Woman. In February 2017, we launched Mocha VR for 360/VR filmmaking. The groundbreaking Mocha VR plug-in (available for Adobe, Avid, and OFX hosts like The Foundry’s NUKE) includes all the tools you know and love from Mocha Pro and optimizes them for 360 video, saving tons of time on laborious 360 post tasks — like removing camera rigs, stabilizing footage, and adding graphics. Mocha VR nabbed two awards at NAB, a “Best in Show” from Digital Video, and a Post Magazine “Post Pick.” And we’re excited to announce that we recently found out it has won a prestigious Advanced Imaging Society Tech award to presented on January 16th! 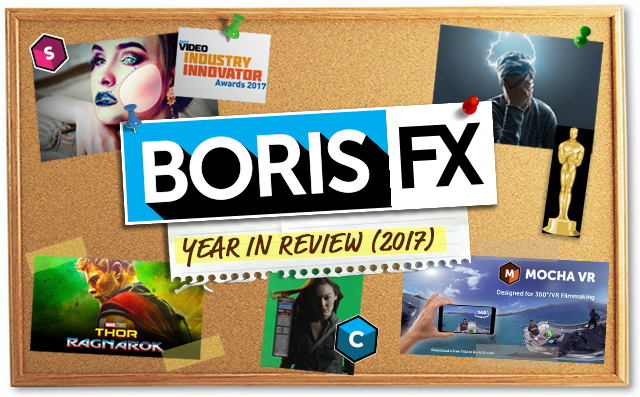 Stay tuned for more Boris FX news, tutorials, product updates and more in 2018!